Instructions: The finished card measures 7 inches by 5 inches. Cut white card stock 10 inches by 7 inches and score at 5 inches on the longer side. 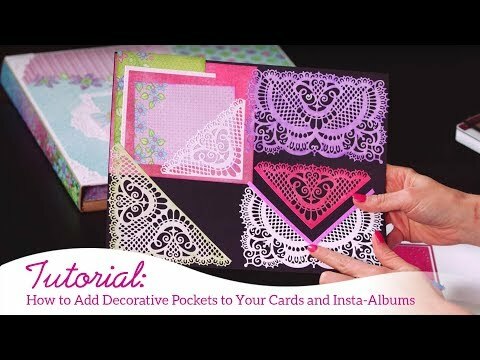 Fold to make a top fold card. Cut a mat layer from white card stock a little smaller than the card base. Distress the edges with Plum Archival ink. Adhere to the card front. Cut another piece of designer paper that is a little smaller than the first mat layer and distress the edges with Plum Archival ink. Adhere on the first mat layer. Cut an eyelet border die cut from the Eyelet Border Basics die and add plum colour. Adhere on the right side on the second mat layer. Cut an A2 card panel design from paper collection. Remove the centre frame and adhere this frame with foam dots on the right side on the eyelet border. Cut out two die cuts from the Petite pockets die set. Add colour on the edges using Plum ink. Adhere on both sides as shown. Adhere the frame cut out on the left side on the die cut. Stamp the images of Tulip flowers, filler flowers and the card in Jet Black ink. Stamp the leaves in Library green ink. 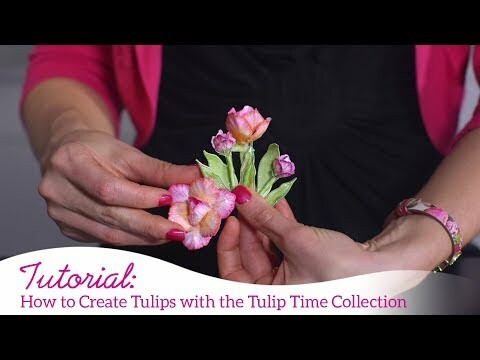 Colour the tulips and shape in the tulip mold. Cut all the images with the matching die. Colour the cart with Brown distress ink. Adhere the cart and put in flowers, fillers and leaves. Arrange flowers and leaves on the left frame. Stamp two butterflies in embossing ink from butterfly border dies. Add white embossing powder and heat set. Cut out the butterflies and add to the card front. Finish with a sentiment from the paper collection.